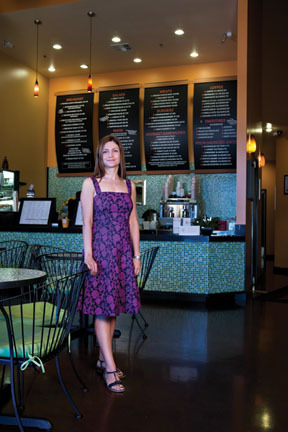 Restaurateur and Las Vegas neighbor Debbie Roxarzade has the recipe for success. The 89135 resident is the founder and developer of the popular Rachel’s Kitchen franchise, which has grown to five locations in Las Vegas with another slated to open in the McCarran Airport D Gates at the end of this year. Not only has she set a trend in fresh, wholesome food with a gourmet twist, she’s used her success to support a variety of non-profit organizations that impact our community. Roxarzade’s been in the restaurant industry for nearly 20 years, turning her passion for cooking into owning and operating multiple dining venues both in Los Angeles and Las Vegas. What started with a small coffee shop in L.A. has grown into a popular franchise now in Las Vegas featuring sandwiches, salads, pastas and more to please every palate. Debbie has always felt it was important to give back for the successes she has attained, and it has been a priority in her hometown since moving to the community seven years ago. She is a Board member of the Court Appointed Special Advocates or CASA Foundation, which identifies and funds the needs of abused and neglected children in foster care. She’s also donated to several organizations including Three Square, Smiles for Survivors, Communities in Schools, Baby’s Bounty and St. Balderick’s Foundation. Roxarzade and the Rachel’s Kitchen franchise owners have also come together to create a website that offers information to online guests about the various organizations they support throughout the year and to educate visitors about the impact of these non-profits in the community at www.friendsofrachels.com. Debbie Roxarzade gives us an inside look at Rachel’s Kitchen and tells us why she feels giving back is so important. How did the concept of Rachel’s Kitchen come about? What do you think makes it so special? What are the challenges (and rewards) of developing a franchise compared to a stand-alone restaurant? Is opening a restaurant at McCarran Airport different then a neighborhood franchise? Why are you so passionate about giving back? How do you unplug after a busy day?